Secure, Dependable Wireless Solutions for I.T. Directors. There’s no such thing as a dull day in the life of a school I.T. Department. But with wireless solutions from ERS Wireless, maintaining a secure, dependable wireless network is easy. Whether you’re planning a 1:1 initiative or already have one in place, we understand the pressures schools are facing today to implement learning environments with secure, robust networks that can handle large volumes of users on various devices for daily learning, as well as mandated testing. The wireless LAN’s we design are scalable and very easy to expand as your schools’ needs increase. In addition to wireless LAN’s, we have a great deal of experience helping school districts eliminate leased land lines with point-to-point networks (PTP). PTP allow you to connect voice, data, and video from various buildings throughout your school district. This also gives you the ability to manage the complete network centrally, which can minimize downtime and disruptions. TEAM Communications- Connect computers, tablets, two-way radio and smartphones. Technology has become an integral part of today’s lesson plan. From researching materials on the web, to sharing information with others, high-speed internet access is essential. At ERS Wireless, we build WLAN’s that are designed for high-density and BYOD environments like yours. Administrators, Teachers, Transportation, Athletics, I.T. and Maintenance departments all need the ability to communicate instantly, but not all of them carry a two-way radio. 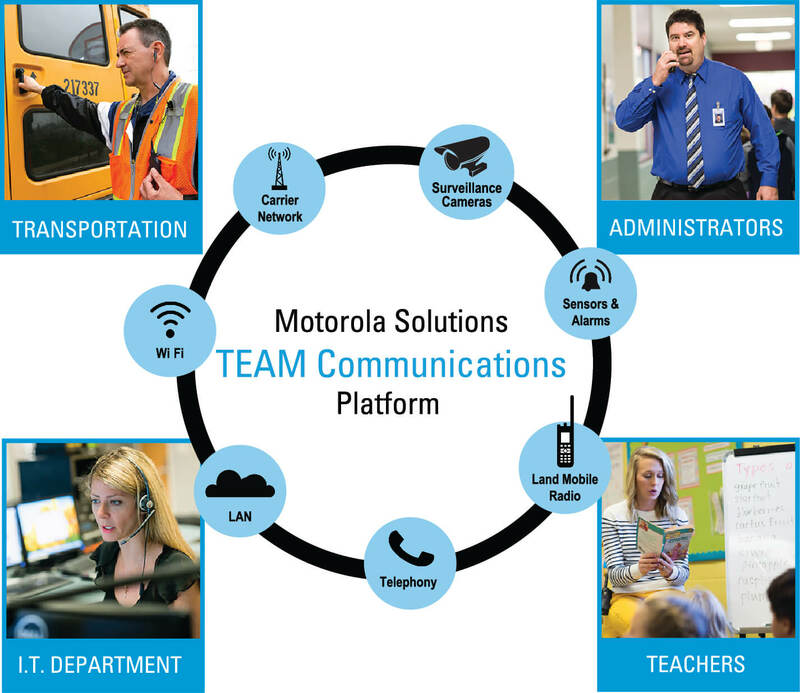 We can help you connect all team members in your school, whether they use a two-way radio, desktop, laptop, tablet, or smartphone. Whether you’re planning a 1:1 initiative or already have one in place, we understand the pressures schools are facing today to implement learning environments with secure, robust networks that can handle large volumes of users on various devices for daily learning, as well as mandated testing. The wireless LAN’s we design are scalable and very easy to expand as your schools’ needs increase. Many students have long commutes to and from school every day- sometimes as much as an hour. Some schools are beginning to consider equipping their bus fleet wuth Wi-Fi connections so that the commute can be utilized by students to do homework. This is a great solution for students who do not have access to the internet at home as it allows them the extra time they might need to get caught up on assignments. It also provides student athletes with access to get homework done while travelling to away sporting events, or for students and teacher to access research information while on a field trip. In-Bus Wi-Fi gives students the ability to stay productive while on the go!